Yes, I am singing Christmas carols. Because draft day is my Christmas. I dare you to name one better, more exciting day for a football fan. But Ravens fans, there are a few things you need to know before the draft starts up tonight at 7:30 p.m.
First, this years draft has been changed up a bit. Where it once used to be held on one day, all day long on Saturday, it has been changed to tonight at 7:30 p.m. for the first round. 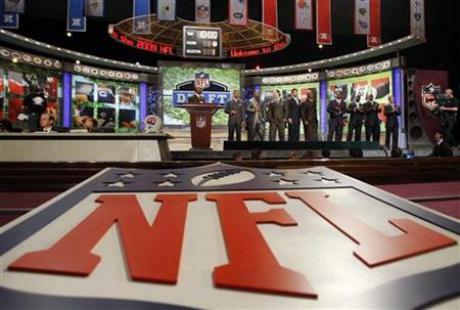 The NFL draft for the 2010 season is going to be prime time over the next three days. Then tomorrow, Friday 23 at 6 p.m., the second and third rounds will be chosen. Saturday, starting at 10 a.m. rounds 4-7 will be announced. How will this new time schedule effect the draft? Will there be more trading down?—there is definitely going to be less sleep for owners, players and agents, that’s for sure. Before the draft gets started, Baltimore know what is on the table in front of us. Click here to read more information on this years draft. In a move many in Baltimore have been waiting for, Ozzie Newsome and his crew signed wide receiver Derrick Mason to a two-year deal with the Ravens. After flirting with the idea of retiring after this past season, Mason was also rumored to make possible visits with other teams to see how much he was worth. However, Mason never fully intended on going anywhere else, which is great news for Baltimore. The receiver has been a big part of this team as he caught 73 passes for 1,028 yards and seven TDs last season. He has caught at least 1,000 passing yards in eight of the past nine seasons. With the signing of Cardinals WR Anquan Boldin last week and Donte Stallworth last month, these three receivers will be a dynamic force with QB Joe Flacco’s passing attack. Head Coach John Harbaugh said “this is outstanding, just great news for the Ravens. Our coaches are happy. Derrick’s teammates are happy and you know Joe [Flacco] is smiling. The Ravens normally known as a team to fear for their defense will now be a team that has a threat in the offense not only in the rushing from running back star Ray Rice, but now with the depth in the passing to Mason, Boldin, Stallworth and most likely Mark Clayton, who has not yet been picked up from other teams. I think Baltimore is about to rack up the skymiles on the football field this season. On the first day of free agency week, the Ravens wasted no time in squashing one rumor that has been going around the past few weeks. No, it’s not the T.O. rumor—at least not yet. Ozzie and crew traded their third and fourth round draft picks to acquire wide receiver Anquan Boldin from the Arizona Cardinals. He is getting a 4-year, $28 million deal. The Ravens in this deal also picked up a fifth round draft pick. Some quick facts on the 7-year veteren. He may be known to get injured, but never anything serious. He comes with little baggage, and with the cost it took to sign him, the Ravens will be able to look into more players, as well. Boldin, in 2009, had 84 receptions for 1,024 yards and four touchdowns. In his career, Boldin had 584 receptions for 7,520 yards and 44 TD’s. Boldin will catch, run and be a dirty player for Flacco to look up and find this coming season. With Boldin to throw to, the Ravens have a big, physical receiver who is sure to do work for Baltimore. What does this mean for the T.O. rumors? Personally, I think those rumors are going to fan out now after this trade agreement and the signing of Donte Stallworth in February. But who knows; the Ravens may just surprise us all. A lot has happened this week and is about to happen in the coming week in the NFL. For those who haven’t had time to keep up, I’m here to fill you in with some quick updates on some news from the week with your favorite teams and players that you will need to know. On Tuesday, Colts QB Peyton Manning underwent neck surgery in Chicago. Don’t worry fans of Manning, it wasn’t a major surgery, and was performed to fix a pinched nerve; perhaps too much strain looking at Drew Brees holding up that Superbowl trophy? But most importantly: this has been tender week for teams to make offers to current players prior to the deadline at midnight tonight. What does this mean in an uncapped year? A team will show just how much a player is worth to them. A tender is offered to a free agent, or a player whose contract with their current team has expired. After this tender offer, if another team signs that player, then that new team will have to give up whatever the players tender offer was, which is draft picks; for example Brandon Marshall of the Broncos has a tender offer of a first and third round so if another team signed him, they would have to give them their first and third round draft picks. A question in the offseason for the Baltimore Ravens on running back Willis McGahee was whether or not he would keep the color purple in his closet. As of right now, the Ravens fully intend on keeping him around. This past 2009 season, McGahee was reverted to being secondary running back behind well-known star running back Ray Rice. This position on the Ravens was a possible reason for Mcgahee possibly on the lookout for another team where he could be the feature RB, plus his want for more money than his $3.4 million for the 2010 season if he stayed with Baltimore. McGahee, though second to Rice, was a key player for Baltimore this season, especially in the red zone. He scored 12 touchdowns and averaged about five yards per carry…not too bad for a secondary RB. Other news on other unknown futures like safety Ed Reed are still up in the air for now but sources say they are sure he will return, as well as the re-signing of wide receiver unrestricted free agents Derrick Mason and Kelley Washington. Baltimore signed wide receiver Donte Stallworth on Wednesday to help in the WR department, and could possibly still look for new players on offense to help quarterback Joe Flacco lead the team to another postseason in the 2010 season.